Daily Messes: Bunnies, Chicks, and Sprinkles... Oh, My! Bunnies, Chicks, and Sprinkles... Oh, My! If you are having a party, or are in charge of bringing dessert to an Easter get-together, try making Easter themed cake balls/pops! Last year, I made bunnies, chicks, and some with just sprinkles. We had a few boys there, so I threw in some green monsters. I'm not sure what I'm going to do this year. First you will need to make the cake balls and place on sticks. 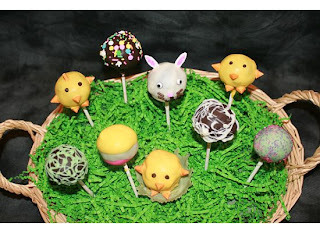 For directions, check out the Cake Balls/Pops Post. off individual petals to form the ears. For the bunny, roll out white gum paste or fondant and cut out ear shapes. Set aside to dry (at least a day). With a paint brush, lightly brush on water down the middle of the ear (you want it to be barely damp, not wet) and sprinkle on pink sprinkles. The eyes on the shown rabbit are candy eyes from a local cake and candy supply store, although Wilton also sells candy eyes. The whiskers are chocolate sprinkles, the nose a pink round sprinkle. For the mouth, I melted Candy Melts, placed in a decorating bag, and piped on the mouth. If you don't have a decorating bag, you can use a Ziploc bag (fill, seal, and snip off a small piece of the corner). The chicks are covered in yellow Candy Melt, with piped on eyes, and orange triangle sprinkles for feet, wings, and beak. To make the chick sitting in the grass, you will need a paper muffin wrapper. Melt some green Candy Melts and spread a layer on the bottom of the cup. Use a lollipop stick and drag some of the melt up the sides of the wrapper to create blades of grass. Some of them will end up breaking when you are done, so bring them up high and make several. Place in the freezer to set for about 5 minutes. Gently peel the wrapper off and you now have a bed of grass! The lace cake pops are covered in chocolate Candy Melt, with drizzled on (or piped on) Candy Melt in another color.